< Previous Hey, There, Bright Eyes! Amen to your second sentence. I wish everyone could see what we’ve seen this year. It really has been extraordinary. More people are using artificial flowers especially in those metal vases. My family has the tradition of planting real flowers on Memorial Day. I have to say I really like the idea of the wildflowers and have enjoyed your photos. I also see the artificial blooms as a sort of denial of the natural process of life and death. Dried blooms have their place also. It’s true. Everything has an allotted life span. For some insects, it’s only hours. Flowers do a little better, and we do very well indeed, if we’re lucky or blessed. Still, it’s a package deal; the end comes with the beginning. I’ve always chuckled when I hear someone ask, “What would you do if you knew you were going to die?” If? I dried some basketflowers last year, and they came out very well, but I don’t think I’ll do it again. I like dried seedheads and such, but dried flowers seem a little sad to me. I’d rather wait for a new season’s blooms rather than try to hold on to what’s past. 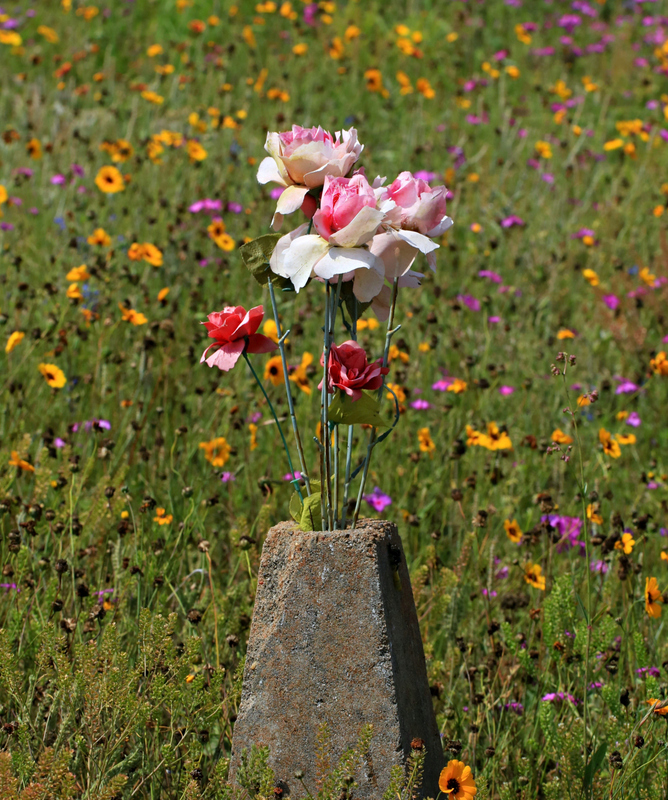 That’s the best cemetery vase idea I’ve seen – will survive lawnmowers and careless feet – no breaking or stealing to melt down for cash with that. The plastic flowers made me smile, too. I have heard some of those stories about thievery in the graveyards over the past months. Copper clearly isn’t the best choice for a flower receptacle. As for the plastic flowers — the good news is that it doesn’t have to be either/or. In time, the wildflowers will fade, and the others will serve for remembrance. But while the wildflowers bloom, they offer precisely what so many people are working to provide: a natural environment for the butterflies, bees, and other insects who face increasing difficulties in finding nectar and pollen. Bronze is another choice for theft. You can’t use glass because of the mower danger – that block seems ideal…maybe there’s a market for enhanced durable concrete holders? You caught that spot dressed it’s best: wildflowers with their fans and habitat entourage providing what many families wish they could be there to do. Plastic or not, those are very-believable roses – and that is a very-comforting scene! Strangely, I couldn’t find a gravestone anywhere near the roses’ ‘vase.’ There were several family plots that had been marked at four corners with columns, stone balls, and such, so it may be that this was one of those markers that someone with a sense of humor had filled with flowers. One section of the cemetery abounded with artificial flowers and wreaths — it’s quite common for Hispanic families to brighten things up with a riot of color. And there were some gravestones that held tokens of affection that obviously had personal meaning: a collection of frogs, a stone dog with a chrysanthemum in its mouth, a plastic bag filled with leaves secured to the marker with a brick. But around it all, the wildflowers bloomed, and bees and butterflies rejoiced. For that matter, so did the people who were flocking to see the sight. At least they did something and they are good fakes. The people might not be able to plant anymore or live far away. I wonder what will happen to my parents and relatives’ grave when I can’t plant anymore. If it will just go to seed and be mown by the company that does the cemetery every now and then. I’ve gone out there every year since I was a kid with mom and now Rick comes with me. In a weird way, we really enjoy it. Go figure. We always enjoyed going to the cemetery as a family to clean the graves and replant flowers on Memorial Day. After Mom’s burial in Iowa I left artificial geraniums at my parents’ grave. Making a yearly trip to tend to things isn’t in the cards, and it’s a situation that more people face in our increasingly mobile society. I wonder now if you came across any of the cemeteries in Britain associated with their movement to convert cemeteries into wildflower havens? There’s an organization called Caring for God’s Acre that is dedicated to the restoration of churchyards as wildflower meadows. They even sponsor a wonderful event called “Love Your Burial Ground Week”! Here’s a little peek at their work that’s so enjoyable. The next time you go to England, you could check their site and see if there are any of their projects in areas where you’ll be. My mom has cloth flowers in pots in a flowerbed, mostly because getting a hose around to water real ones is too much of a hassle. She’s one up on my mom. I gave her a fake philodendron which she then proceeded to water for months before I caught her at it and told her it was fake!. Well, at least the fake philodendron wasn’t going to get root rot from being over-watered. That’s funny, and one of those delightful stories that lingers. I saw that there was some severe weather up your way not long ago. I hope you didn’t get any hail damage, and that the power stayed on. In cemeteries like this, it isn’t an either/or proposition. The wildflowers are nurtured and celebrated, but others are allowed. I suppose my least favorite approach is our American “memorial garden,” where every stone is identical and nothing is allowed but a single vase with artificial flowers. Do you know the work of your British group called Caring for God’s Acre? They’re dedicated to the restoration and preservation of church burial grounds as green space: meadows and grasslands that not only complement the churches and stones, but also serve to increase healthy habitat. It might be worth looking at their list of activities for June; there will be activities all over the country. Most things in their natural state are so much prettier than the “faux flowers” man creates, but I can see where these roses might have their day in the sun after the wildflowers go to seed. Perhaps the thing is somebody wanted to pay their respects without having to check regularly on what they’d left! Artificial flowers are common in cemeteries, and I certainly wouldn’t want to discourage them. Still, these wildflower cemeteries not only please the eye, they also provide habitat for pollinators and other creatures — like the little squirrel I found in the tree. I’m glad to see the number of wildflower-graced cemeteries increasing, and glad that their advocates keep explaining to people that no, the cemetery isn’t “a mess.” They’re just waiting to mow until after the flowers go to seed, so there will be flowers next year, too! The pairing of the two types of flowers is quirky. It’s a great shot though and I appreciate the love and care of one and the history and evolution of the other. The image is a little quirky, but that’s what appealed to me. It seems to encapsulate a lot in a simple image: cultural differences of various sorts, our preference for manufactured over grown, even the frustration of butterflies and bees trying to feed from such flowers. The roses are the very epitome of a non-native species! “As our world becomes ever more urbanised and agricultural practices more intensive, it is important that our pockets of green space are protected and preserved. Churchyards can often be the only remaining unimproved green area within fragmented landscapes and therefore have an important role in conserving natural habitats. It’s been interesting to discover how many of our cemeteries are being allowed to bloom. I hope there are more in the future. I used quirky in the most positive way. :) I like quirky! I love it that cemeteries, some anyhow, allow the wildflowers. Our urban parks management could follow that lead. Oh, I took it as positive. In my book, quirky always is positive! These cemeteries in Texas that you and Steve are photographing, are about the most cheerful ones I’ve ever seen. They always put Martha Washington geraniums on my grandparents’ grave, for Mem’l Day, I think my grandmother specified. But we’ve put artificial ones on, too, for the summer, and those looked fine. Once I get done sorting, I have some photos that show a broader view of the floral wealth in this cemetery and another — plus a few landscapes. But honestly? I’m not sure any photo can do this year’s flowers justice. This is the first year there were so many bluebonnets I caught their fragrance. I’d never heard of Martha Washington geraniums. They’re beautiful, but it looks like their season here would be short, given their love of cooler weather. “Regular” geraniums were used as much as peonies in Iowa, and I put artificial geraniums on my parents’ gravesite the last time I was there. There’s something about geraniums, real or otherwise, that does seem fitting. No plastic flowers for me, ever. My dad was relentless in his condemnation of them. They certainly did not have them in Holland. Of course flowers from Holland are cut in the morning, and for sale in NYC that afternoon. I’ll leave you with this poem. Years ago one of my uncles died and a few years later my aunt moved out of state to be with their daughter and her family. In the interim, because my aunt’s health was failing, she resorted to having some artificial flowers placed on my uncles grave here. After she moved, she asked me to take care of those flowers and place them each year on his grave. She is gone now too, and the artificial flowers got pretty tattered and so ever since when I place real flowers on their graves I think of those artificial ones and how much they meant to her. What a wonderful story. It certainly blurs any distinction between real and artificial, doesn’t it? When it comes to flowers and graves, it’s the remembering that counts, and the precise way we choose to mark our remembrance isn’t so important. It must have been a great comfort for your aunt to know that her wishes were being honored, and that your uncle was being cared for in that way. Well caught. I can see a collusion as well as a collision because somehow the abundance of wild flowers seems to soften the artificial ones and make a space for them. There’s artifice in all of life, of course. But as individuals and as societies, we seem increasingly drawn to the artificial: the rise of so-called artificial intelligence being only the latest attraction. While I’d never demand an end to artificial flowers, I’m always going to enjoy places where the real is allowed to flower. Beyond that, can you imagine the feelings of those poor, plastic flowers as they watch the real flowers creeping toward them? I wonder if they envy those ephemeral blooms? While it may be nice for artificial flowers to always be there for our enjoyment, I think there is a profound pleasure in the impermanence of those that are provided by Nature. Just as we look forward to the changing seasons, although with some complaining, so to with the natural approach and farewell they provide. But, with that chunk of concrete vase in the meadow it is nice that someone thought to decorate it for others to enjoy. I agree. The impermanence of the wildflowers accords with the basic reality underlying a cemetery, while the (relatively) ever-lasting flowers suggest the memories that continue after death. It’s a good combination, and accords well with my both/and approach to life. What I find ironic is that all the wildflower-graced cemeteries I’ve seen allow for artificial flowers as well, while most “standard” cemeteries weed-eat everything down to a nub. In Galveston, there is a collection of cemeteries known collectively as the Broadway cemeteries. Some let the wildflowers run rampant, while others apparently have a crew with scissors whose only job is to eliminate those danged “weeds.” This year, I’m going to try to get some photos showing the comparison, provided the wildflowers put on their show. They’re different species, and a little behind, so I’m not sure what this year’s crop will look like.